This revolutionary design from Joseph Joseph is such a simple idea, it leaves you wondering why it hasn't been thought of sooner. By angling and layering each compartment on top of each other, it enables you to store a full cutlery set in less than half the space of a conventional cutlery tray. Items can be placed inside either head or handle first, but the design also features handy icons for easy identification. 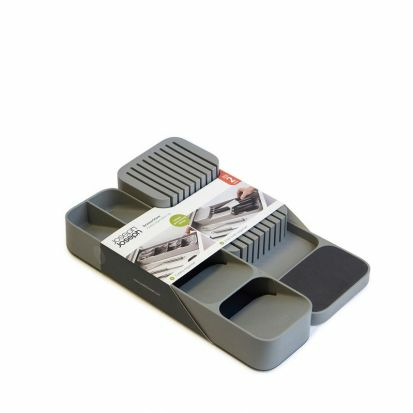 With non-slip feet on the base this will stop the unit from sliding around in your drawer. Suitable for drawers with a minimum height of 8cm (3¼inches) and 7.5cm (3inches). This 2-tier knife organiser is the perfect solution providing both safe storage and easy access for a range of kitchen knives. It features two levels for different blade lengths and can hold up to nine knives in a neat, compact space. Suitable for knife blades up to 9inches (23cm).